Although being a very fun activity that almost anyone can do, metal detecting also requires specific equipment and special attention to a few details. So, either if you’re a beginner trying to figure out what you need, or you’re just looking to update your equipment and method, here are some simple tips that can help you choose new equipment and/or decide what equipment you should use. What Essential Metal Detecting Kit Do You Need? For any successful metal detecting expedition, whether long or short, there are always essential things you need to have with you. Let’s look at the most essential gear you need. Seems obvious, right? Metal detecting without an actual metal detector might be a very hard task. However, choosing the most appropriate detector for you might be a challenge, if you don’t know what you should be looking for. Where do you intend to go metal detecting, and how frequently? Do you want to search for specific materials or items? The answers to these questions are crucial, because they determine what type of metal detector will best fit your needs. For example, if you live near water, or intend to do most of your hunting in beaches, lakes, and so on, you will need a waterproof equipment that won’t stop working as soon as it gets wet. If you need to find objects that are buried deep, either in water or land, your best option is to acquire a detector with high power. Also, if you intend to go metal detecting very frequently, and will probably carry the metal detector around or bring it with you to travel abroad, make sure it’s as light as possible, shock resistant, and that can be separated into easy-to-carry parts. Finally, consider the two last questions. If you’re highly experienced, you can purchase a more complex equipment with tons of different functionalities, but if you’re a beginner you’ll probably be better off buying a simpler equipment with a friendly learning curve. Finally, buy the equipment which best suits your needs within your own budget. Take your time to read reviews, specifications, ask questions and get unbiased and comprehensive answers. You won’t regret it. Even if you’re not going hunting very far away or for a long time, an appropriate case to carry your metal detector is essential. Besides making it easier to carry the detector, it protects against shocks or other physical aggression. It’s a good option to invest in a resistant, waterproof, and easy to carry case. Having extra batteries for your metal detector is important. Choose rechargeable batteries, which prevent you from having to keep buying new ones. If you’re planning to hunt on land, you’ll most definitely need a shovel. Choose one that’s light and not very large (so it’s easy to carry, or drag), but at the same time strong, resistant, and relatively long. It may help if you know exactly which type of soil you’ll be digging in, but still these are basic characteristics you need to look for. Also, choose one with a small head; it’s not advisable to dig huge holes on the ground. For small areas, consider having a trowel. For metal detecting on the beach, bring a scooping tool with you. They’re generally smaller than a shovel, don’t need to be as strong or resistant, but you should choose a material that is resistant to salt water. Choose a pouch to store your findings, but first consider what type of objects you’re looking for. You can have a small pouch if you’re searching for, say, gold or coins, but you’ll need a bigger bag for larger items. Have a backpack/bag to carry the rest of your equipment. Consider the size and shape of your equipment. Also, pay attention to whether the bag material is resistant (water resistant even, if you’re planning to hunt in beaches or near-water sites), and how light it is; remember, you’ll have to carry it along with the rest of the gear. Choosing the appropriate clothing and accessories is also essential. Safety first! Look for a nice, resistant, comfortable pair of gloves, to keep your hands clean and safe. Also, if you’re planning to visit a rocky region, tunnels or caves, consider taking a protective helmet. Remember to have resistant and comfortable shoes that will allow you to walk for hours on all types of terrain, step on the shovel to dig if necessary, and, as a golden rule, that don’t have any metal on them. For near-water hunting, take appropriate shoes (rubber boots are always a good choice, since they’re waterproof and tall, but don’t forget they have to be comfortable) and waterproof clothes, if possible. If you’re going to spend a lot of time in very dusty or windy places, protective goggles can also be useful. And if you’re planning to stay under the sun for a long time, a hat and sunglasses can be helpful and make your journey more comfortable and safer. Also, if you want to keep small things at hand (like batteries, a first-aid kit, GPS, pinpointer, or just a small pouch), consider buying a nice utility belt that serves your needs. If you have the budget, the means, and want to bring your metal detecting activities to the next level, there are a few additional pieces of equipment that can make your life easier and your hunts more efficient. Although not essential, a pinpointer is always a very useful piece of equipment to complement your gear. It works as a precision tool, to help locate smaller items or simply just pinpoint an item’s exact location. Since it’s usually small and light (two very important features you should be looking for), make sure it has distinctive identifying features like, for example, a shocking color and/or a mode that emits sound if not handled for some time while on ON mode, so it can be easily located if you drop it in the water or any other place where it’s difficult to see. Also, when choosing a pinpointer, it’s always best to choose one that is waterproof. Especially if you intend to hunt at high depths, make sure you choose an equipment that is appropriately submersible, and not one that just slightly resists being dropped on water. If you have some experience in the field or are planning to hunt in different kinds of terrain, having different sensitivity modes that can be manually adjusted is also very helpful. Moreover, some pinpointers also have nice features like a built-in scrapping tool and/or a flashlight (you may also consider buying these items in separate, since they’re useful) to help you locate and dig items with more precision. 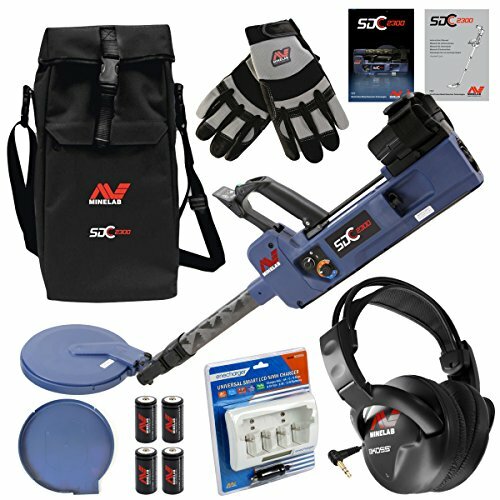 Having an appropriate and comfortable headphone set allows you to keep the sounds to yourself, not bothering anyone that is around you, but also allowing you to easily hear more subtle sounds coming from the detector. The main features to look for in a good set of headphones are comfort (usually translated in extra ear cushioning, that fits your ear shape well) and a considerable cord length (around 6ft or more), so you can move freely and still connect to the detector. Also, choose a set that allows you to manually control the sound volume. One better option, if you have the means, is to buy a metal detector with headphones included (ideally, wireless), or one with a Bluetooth function that allows you to purchase a set of wireless headphones to use in your hunts. Imagine finding an item buried among tree roots. In this scenario, among others, having some kind of cutting tool with you is essential. Usually, a serrated knife works best; make sure it’s a resistant and sturdy material, but not very big, so you can use it in small holes and objects. On the other hand, if you know you’re going to need a bigger tool, you can opt for a small axe. Don’t forget to make sure it’s portable and easy to carry around. Although these are the most important pieces of equipment you can have in a metal detecting expedition, it’s important to always choose what best fits your needs. You don’t necessarily have to have all of them, but when you decide to choose, it’s best to be well-informed and take your time to review and compare your options. Consider reading other users’ reviews, ask more experienced hunters for advice, ask plenty of questions to the sellers before you buy anything. A good and appropriate choice will save you lots of time and make your life easier, so it’s better to take your time and choose wisely. Whether metal detecting is a steady income source, or just a hobby you love (or intend to explore), there are always a few basic things to have in mind. Here we present some basic advice for those who want to start, or continue, metal detecting activities in 2019. Choose your equipment well and familiarize yourself with it before you start hunting for treasure. This is will make the task easier and more enjoyable. Leave each place (more or less) how you found it. Fill the holes you dug, don’t leave trash behind and don’t destroy or deteriorate property. Go where the people are. Or better yet, go where people have been at for a very long time. There are plenty of places, ranging from historical sites to gardens, parks and beaches, where many people usually spend or have spent a lot of time, and that are likely to be filled with all kinds of treasures lost over the years. Besides knowing where to go, it’s also very important to know how to do it. And we’re not referring to the equipment or methods used, but to knowing if, where, and when, you’re allowed to do it. For example, for most historical or archaeological sites, it’s usually prohibited to use metal detectors. Same goes for private properties without the owners’ consent, or certain state parks without a license. Make sure you know the law. Only after securing everything you need can you start selecting where to go. Yours or nearby properties. This is a basic one. Before thinking about digging anywhere else, make sure you know what’s in your backyard. If you can get your neighbor’s permission, checking theirs is also a good option. You don’t have to travel far, and chances are you may find more than you were initially expecting. Beaches. This is also a basic choice. Beaches are the places where many people pass by, practice sports or just relax, so chances are there are plenty of things dropped, posteriorly hidden away by the sand and wind, or even brought in by the tides. You can search near the places where towels are usually placed, but also in sand dunes, low-tide places or activity areas (like beach football, volleyball, or jogging). Also, make sure you find a balance. Overcrowded beaches are likely to be visited by too many metal detecting aficionados and people may feel bothered; on the other hand, secluded beaches are not visited by that many people, so there probably won’t be many hidden treasures. Also, unless you have explicit authorization from the owners, avoid private beaches. Popular parks, gardens, trails, forests and camping sites are also good basic choices. Many people pass by, doing various activities like jogging or dog walking, and items are often dropped or lost. In this case, you also need to be aware of the existing laws regarding metal detecting in such places. River banks or shallow ponds. If you don’t mind getting a little wet, near-water sites are great for treasure hunting. People often drop things in the water, or items are dragged by the currents, so you might find some interesting things. The same goes for coastal regions; in this case, make sure to go in low-tide periods. Always remember to check how deep the water is, and if the water is clean enough! Health and safety first. Post-storm or natural disaster sites. Although this one is not for the faint-hearted and may seem like it’s a bit creepy, it’s a good option. After violent weather, various items are spread all over the region or even dug up from below, so you may find interesting things. Just make sure you can manage going past a site that has seen hurricanes, floods, major storms or other natural disasters without feeling discouraged or sad. Abroad vacation sites. If you’re planning vacations abroad and you would like to include some metal detecting in your schedule, there are a few places in the world which usually don’t have any restrictions whatsoever when it comes to this activity. Visit places like the Canary or Caribbean Islands, Maldives, Dominican Republic, Indonesia, Kenya or Thailand, where metal detection is generally allowed by law. Sports sites, concert halls, or other places where mass events occur. Major sports events are probably where the highest amount of people gather on a consistent basis. Therefore, stadiums and surrounding areas are very good places to explore. Familiarize yourself with the most popular sports in the region you’re planning to explore, and the scheduled activities. According to the estimates, in 2019 the most popular sports in the U.S. will be American football, baseball, basketball and ice hockey, so check the areas where these events are usually held. If you’re in Europe, soccer (also known as football) is by far the most popular sport. If the laws of each country or region allow, explore football stadiums and surrounding areas, ideally after each game (but before the area is completely cleaned). If you’re in Asia or Australia, try the places where soccer, cricket, motor-sport, martial arts, or tennis competitions usually occur. You can also explore other places for popular mass activities, like concert sites, athletic competitions or others. Chat with the locals, inform yourself about the most popular activities/sites and schedules of that region or country. If your child is into adventure walks and looking for treasure on the beach, you might want to invest in a metal detector for them. Metal detectors are a great tool to add intrigue and excitement to any walk or hike and can be fun even in your own backyard. While there are real metal detectors and toy metal detectors, this article will focus on showcasing the top 5 real metal detectors for children, looking at the features of the top metal detectors, why these are are good for children (specifically), and finally, we’ll look at accessories for each model reviewed. 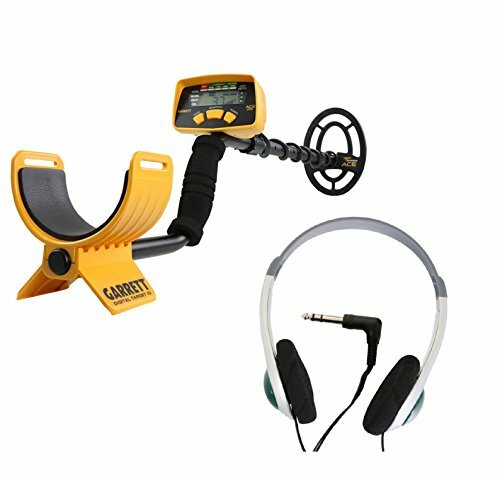 The Bounty Hunter Gold-PL Gold Metal Detector comes with headphones, which makes finding treasure even easier for children. It also comes with a battery life indicator, so you don’t miss out on opportunities to find metal with your children. This metal detector has an extendable handle that allows children of varying heights to use it while combing the beach for coins and other treasures. Because it’s lightweight, even smaller children can carry this metal detector around the beach and streets looking for gold coins or other metal objects. It requires 2 batteries, but they are easily found in any department store, or you can even buy them online when you purchase the metal detector. This device offers an easy to use and easy to read knob-style control interface that is attached to the handle of the detector, and it has a speaker in the interface so you can hear whether or not you have found metal in the ground. This metal detector doesn’t come with extra accessories, but the quality of the detector itself is worth considering when making your purchase. Most children have a pair of headphones at home anyway, so it’s not a showstopper that this metal detector doesn’t come with headphones. 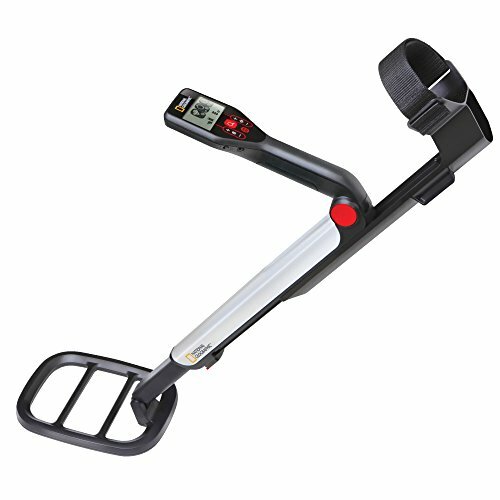 The ergonomic handle on this metal detector makes it easy for children to hold and support while they search for metal. A deeper range of detection means more opportunity for children to find metal and be excited by the activity. With the ability to discern between metal and trash, the Bounty Hunter TK4-PL Tracker IV Metal Detector provides more opportunity for children to have successful metal hunting trips. A built-in speaker means children have the option to wear headphones or listen through the knob-style control panel. Bonus shovel for digging when your detector goes off! 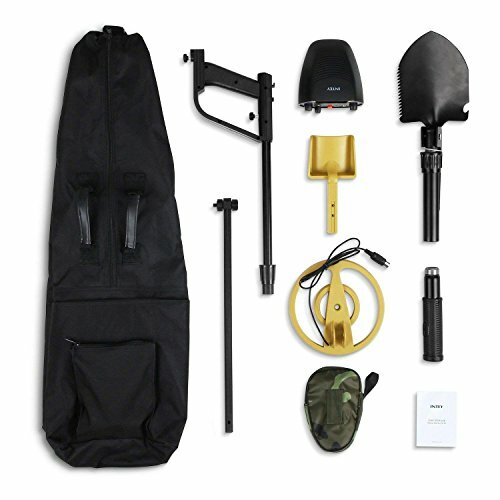 The INTEY metal detector comes with a convenient shovel and carrying case for easy portability. The case fits snuggly around the metal detector to protect it when in transport. This lightweight metal detector provides an easy to read control panel that means even little children without developed reading skills can follow. It uses arrows to point to indications of metal detection. The shovel makes it fun for children to dig once they find something in the ground based on the detection signals from the control panel. This is a good entry-level metal detector for children because it comes with four operation modes and children can play around with it to try to get readings from different materials. There is also a bright LCD screen for easy readability for older children. There're two modes for choosing, all metal mode and disc mode. Metal can be detected once coil approach it, and there's beep sound to remind you. Press the red button of pinpoint, move kit slowly, and release button when it beeps. Both the adjustable stem and the coil at the end are waterproof, so you can search for lost metal items at the bottom of a shallow pool or stream. There's an audio jack provides you a chance to search treasury in noisy street or beach, free of being disturbed and the volume can be modulated. This metal detector comes with batteries, an instruction manual, and adjustable headphones from the manufacturer. The Garrett ACE 200 metal detector is great for children because it comes ready to use straight out of the box: it comes with batteries! Children can set the handle height for themselves, and it is lightweight for easy portability. Headphones make it easy to explore and hear the detection sounds and children will enjoy the bright color of the metal detector itself. A bright LCD display with large format numbers provides quick access to information when a child is on the hunt. Lightweight – only 2.3 lbs! The National Geographic Pro Series detector doesn’t come with any accessories; however, it does come with an instructional manual. Backed by a brand parents trust to be educational, this metal detector comes ready to use right out of the box because it does not require any assembly. 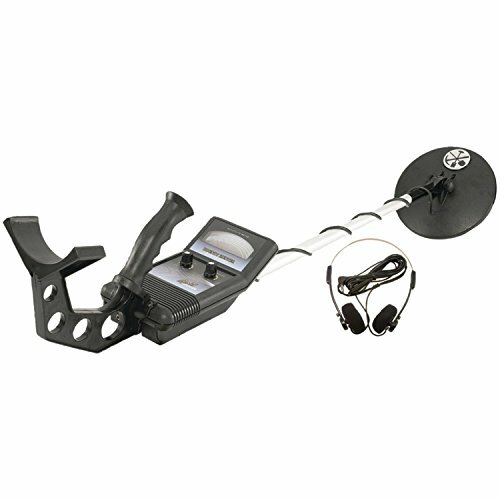 This metal detector has the largest coil detection head of the five metal detectors reviewed. The lightweight aluminum structure makes it easy for children to move around quickly, and the collapsible nature of the product means it can fit in a suitcase or in the car with ease. COMPACT, LARGE WATERPROOF 10" COIL, LIGHTWEIGHT and collapses to just 22 inches and 2 lbs. Great for travel! 100% SATISFACTION GUARANTEED - National Geographic stands behind this Pro Series Metal Detector with a TWO-YEAR warranty. All of these metal detectors are good introductory products for children interested in searching for coins or other precious metals. Their price range makes purchasing them for children easy, and the warranties give parents a sense of relief when investing in a product like these. The standards are the same for all of them: adjustable handles, easy to read screens, multiple sounds and price points are close. 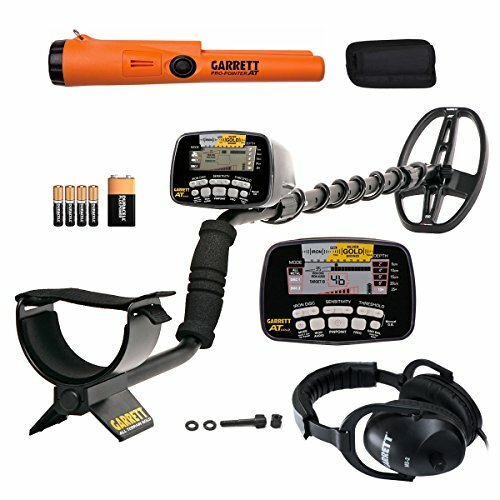 If we have to pick a clear winner, it would be the Garrett ACE 200 Metal Detector because of all the extra accessories it comes with including batteries, so children to start using it right away, the color of it and the sturdiness of the product, making it more interactive for children. Perhaps you’re dizzy from the number of different gold metal detectors available (as well as their dizzying price tags). Here I’ll discuss your best options – cutting to the heart of the matter. This article will help you to make a decision, whether you’re going for value or functionality, whether beginner or pro. 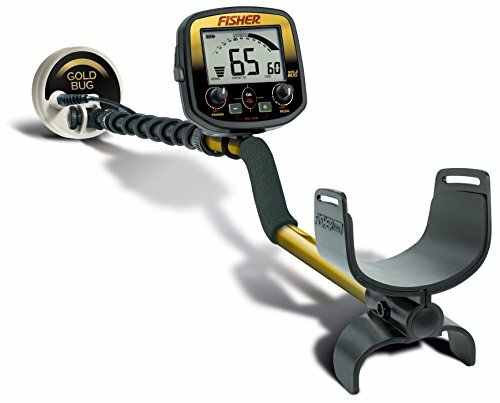 After reading this you will have a clear idea of the best metal detectors for gold to buy in 2018. Most gold nuggets are under a gram in weight – incredibly small and for this reason, the sensitivity of your metal detector is critical if you’re to have a chance of picking them up. And almost all are found in the ground that’s highly mineralized (within soils composed of high amounts of iron). a single grain lying at a depth of 1-2 inches. Keep and eye out on the transmitter coil (aka search coil) size and type. There are two types: wide scan and concentric. Widescan coils show more resistance to feedback from the highly mineralized ground. Concentric coils have more sensitive discrimination abilities. The size of the coils also matters; the larger it is the more depth/area you can search when it comes to finding larger-sized nuggets. With greater size, however comes reduced sensitivity to smaller-sized nuggets, but smaller coils excel in discriminating small flakes – particularly when dealing with polluted ground. Both PI and VLF detectors should have a ground balance feature, which can be used to discriminate against iron. Automatically adjusting ground balance detectors, however, are perhaps superior in terms of their discrimination accuracy compared to manually adjustable ones. With that said, here are the top metal detectors to consider – all are renowned for their gold-detecting abilities and most are extremely popular in today’s prospecting world. What Are The Best Gold Detectors? The most recent from manufacturer Fisher Labs, this detector delivers the goods. It’s easy and fun to use. Because of its simple design, a complete novice to gold prospecting could have this up and running quickly. Strengths include quality of discrimination and its ability to tolerate “hot ground” (high iron content ground) exceptionally well. This extends to if you’re searching around trash-filled areas. In that situation, this detector is good at overlooking any present iron among the trash (flashing you an identification of iron on the LCD screen, even when you have it set to non- discriminate mode). It’s not however, suited for serious depths – you’ll need a pulse detector for that. You can purchase this with an optional 5” x 10 “ coil, which I’d recommend as it’s a snug stable fit. Overall – a detector with exceptional sensitivity and especially useful when scanning around loose rock and soil areas, as well as around trees and undergrowth. This is a reliable veteran of gold detectors, also considered entry-level due to its simplicity. As a VLF metal detector up this is very suited to detecting the tiniest of gold nuggets, but may not be ideal when dealing with interference from highest mineralized ground (it does, however, use automatic ground balance adjustment which is generally quite accurate at offsetting this noise). Largely this detector is less used nowadays, partly because of its age; for example, it lacks an LCD screen and also has a significantly lower sensitivity (17.8 kHz) than some of its competitors (e.g. the Gold Bug 2 works on 72 kHz). However I’ve added it on the list as I think you can consider this a good gold detector most suitable for entry-level prospectors looking for a simple machine that can do the job and is very lightweight. The pinnacle of electronic gold prospecting technology. A well-known brand that emerged in the mid-60s. It really took advantage of the re-emergence of interest in gold prospecting about a decade ago when gold prices boomed. This model, the AT gold, is the latest in their line and has been in popular demand since. It’s a sophisticated machine and highly customizable/adaptable for your needs – including very accurate iron discrimination and automatic ground balancing. It’s completely waterproof, which is not very common at all when it comes to gold detectors – so this is your choice for searching at the bottom of streams and rivers. One standout aspect of this product is that comes with several choices of coils, which is excellent value. AT Golds also tend to be fantastic deals when it comes to accessories. This may be the reigning champ of detectors, at least in terms of popularity, in the gold hunting world. As a VFL it’s specialized to finding the smallest of nuggets down to the size of a small grain – we’re talking incredible sensitivity. Which, as it were, is also its weakness; when it comes to very mineralized ground it can be thrown off by interference. There are however, customizable settings you can use to ring out specific tones for hot rocks being detected (as opposed to gold). You can choose between three mineralization options: low, medium and high, in order to customize to the type of ground you are searching (ground balance is manually adjustable). In many ways this is all you need in a solid gold detector (unless you’re looking to search for larger gold bullion stores at greater depths). It has a proven track record of finding gold, particularly along bedrock containing cracks of about a few inches in depth (small nuggets of gold can sometimes sit in these grooves). You will have less success for anything at greater depth. Standout features of the gold bug includes its very lightweight, large 10-inch coil and high frequency – allowing you to search across large areas easily, as well as to detect the smallest pieces of gold. Another well-known brand. The GMT is a bestseller and potential rival to Goldbug in the gold prospecting world. Despite being around for many years now it easily competes with and in many cases beats newer gold metal detectors being released even now (although lacking the latest additional features that some of these have). It doesn’t lack the LCD display however, having been an innovator at the time of its release, which can give you a better feel for exactly where to dig and what you are look looking at. Like the Goldbug, it’s a VFL detector so can sniff out the smallest of gold crumbs. It features automatic ground control to deal with specific mineralization conditions of your location. Despite it having a slightly lower frequency of 48 kHZ it makes up for this with an iron target analyzer and its elliptical coil also helps to filter out extraneous metals. This one looks to me a bit like a military sub machine gun/watering hose. The ATX was Garrett’s first gold detector that worked exclusively by pulse induction. Completely waterproof, you can take this down to the depths of up to 10 feet. On a pragmatic level if it rains you have no need to close up shop. It’s a high-level machine for professionals. It’s PI capabilities lets the hunter seek at extreme depths for large gold nugget stores – a useful machine to have particularly in areas with a track record for bestowing large gold stores. It’s foldable, so you can pack it into a bag and it comes with different options of coils – the DeepSeeker mono coil is the most suited for large gold nugget collections buried deep. But its weight might detract some users – swiping this for hours may be challenging. Which is not surprising considering the machine was based on a Garret design line of landmine detectors and contains a 20” DD coil. The GPX 5000 is Minelab’s most recent in the GP/GPX series. It’s considered by many to be the standard for PI detectors when looking for large gold nuggets at massive depths. It has a reputation for being uncannily good at this task – specifically designed to pinpoint gold in ground with a high percentage of iron (and has gained a reputation in Australia, which happens to have very high iron levels in its gold-carrying areas). You’ll also get an enormous range of coils to choose from – small coils can work a charm with this detector and let you reach incredible depths with the right adjustments. 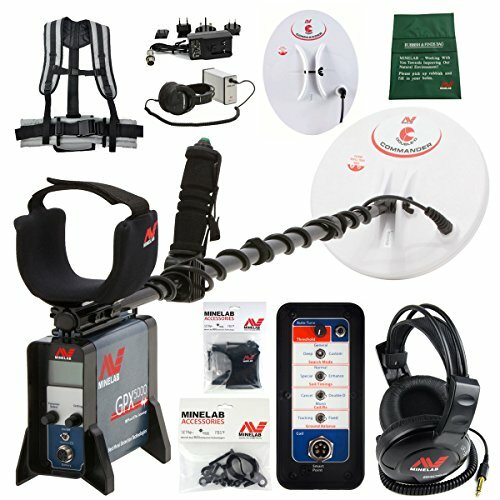 Minelab GPX 5000 Metal Detector with Commander Series 11″ Round Double D Coil, 15″ x 12″ Monoloop Coil, Coil Covers, Metal Detecting Harness, Lithium Ion Battery, Koss Headphones, Battery Charging System and Minelab Finds and Rubbish Bag. MPS, DVT & SETA Technology- delivers to you the most technologically advanced detector yet, making small hard to hear nuggets more obvious. New Timings- make the GPX 5000 the most versatile ever. It's like having 8 detectors in 1. In addition to five of the Timings found on the previous model the GPX 5000 introduces three new Timings: Coin/Relic, Salt/Gold and Fine Gold. Six preset Search Modes- gives you easy switch on and go detecting. In addition to General and Deep search are: Hi-Mineral, Patch, Hi-Trash and Pinpoint. All six Search Modes can be modified to your personal favourite settings. Menu accessible Search Modes can also be renamed. Increased Rx Gain adjustment- allows you more precise sensitivity control for optimum performance. Automatic Ground balance- options make it easy to adjust the detector to suit all ground conditions. e.g. (Fixed, Tracking, Tracking speed, Ground Balance Type, Quick-Trac button). Audio adjustments- to maximize target signals for your personal hearing ability e.g. (Threshold, Tone, Audio Type, Signal Peak, Response, Target Volume, Volume limit, Stabilizer). Iron Reject adjustable- to suit the iron trash level where you are detecting. The SDC is a great choice for gold hunters looking for a rugged tough detector that can also search in water – and its lightweight and comfortable design that makes it a pleasure to use. The unusual thing about this detector is that it is fills a niche missed by both PIs and VFLS – if you’re looking to search for the smallest pieces of gold nugget that are scattered in highly mineralized ground this is your weapon of choice. It uses PI technology but is fitted with a small coil, so while this detector is resistant to interference from minerals it is extremely sensitive to small pieces of gold, which can often lead a trail to even bigger deposits. This device may lead to a new not-before-seized opportunity in gold hunting. Also foldable for easy transportation in a backpack. Minelab’s latest baby – and a beast of a detector that appears to have an unparalleled ability to discover gold nuggets even in areas previously drained by hunters, which is of course partly why it costs a whopping $10K. So if you’re willing to put up some initial capital and go for a long slog you will have a dangerous weapon at your hands that can see things other detectors pass by. Perhaps the best gold detector available right now. Having the exact gold prospecting detector you’ve been looking for doesn’t remove the essentialness of ensuring your site has a proven track record for gold harvesting. It’s more than worth the extra time doing your homework as gold is valued for a reason – it’s rare, which means you won’t come across it accidentally in most cases. Strategy beats coincidence here. I’ve covered some very solid gold detectors, some of which have been around for while. But with the likes of brand-new models such as Minelab’s GPZ 7000 we are seeing some of the best yet to have ever been made. Nevertheless, all of the machines listed are proficient gold detectors and at a point it comes down to being proactive and doing the work. 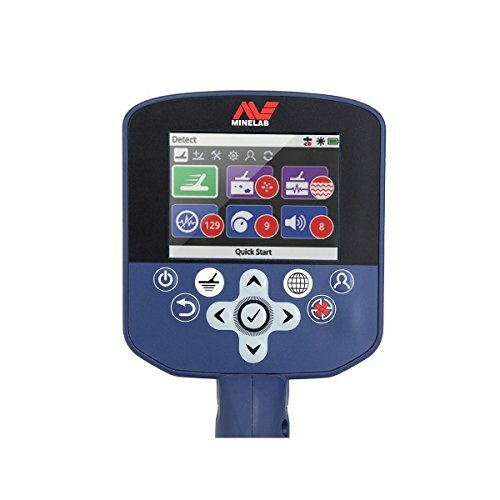 Looking for a very good value for money all-around detector? You may want the official Goldbug Pro – it’s powerful and is affordable an ideal for beginners. If you want the best out there – then the GPZ 7000 will give you a serious edge over the competition. If you are already an enthusiastic metal treasure hunter, you may know the frustration of spending hours of extra time, building up a sweat while digging up what turns out to be worthless garbage in the form of scrap iron when what you were hoping for (or dreaming of) is precious metals. If you’ve experienced the confusion of sorting out what areas of ground are providing false readings and which area is actually hiding the treasure you are searching for, then you’ve found your answer. In addition to reliability, there is also an enormous demand for quality, inexpensive metal detectors. If you are just getting into this fascinating hobby, you may not realize yet just how expensive it can get. To make your entrance into this exciting world even more manageable, we’ve taken the time to test several different models for you. After evaluating a number of models and compared their assets to cost of purchase, we invite you to try the best metal detector for the money on the market today, the NHI ForagerGO. Each item of this set is aimed to provide as much comfort and convenience as possible. From the metal shaft that is fully adjustable to the arm-supporting comfort handle, this metal detector is easy for people of all sizes, ages, and levels of experience to utilize in the hunt for secret treasure lost over time. We’ve put together this review so you will have all the information you need at your disposal to make an educated decision. Then when you are ready, you’ll know that you are gaining an exciting, yet frugal purchase for yourself or a loved one who is eager to enter the world of metal treasure detection. There are a number of the key features that make this particular detector distinctive. The NHI ForagerGO has a lot to like. • A lightweight design that makes it easy for all users, even younger children. • Easy assembly and disassembly to make transport and storage very convenient. • Simple to use – there won’t be any need to read complicated assembly or use manuals. • Beginner’s guide to assist the newbie in getting up to speed faster. • The ergonomic adjustable shaft design makes it easy for anyone to handle. • Comfort grip handle allows for excellent control as you hunt. Also prevents your hand from becoming fatigued too quickly, a primary concern of many new hunters as they get accustomed to the equipment. • An easily adjustable one-touch auto-tune setting for quick configuration. • Both digital visual and audio feedback displays to make detection for accurate and eliminate excessive guesswork. This dual feedback also helps negate the extra work of digging needlessly. • Adjustable volume and sensitivity settings. • 7.5″ waterproof search coil. • Water resistant aluminium housing. • Requires 2 x 9v Batteries that are not included. • 1-year warranty provides peace of mind just in case you have issues or need any replacements. Who Is the NHI ForagerGo Waterproof Metal Detector Designed For? The short answer? Everyone. With all of its astounding design features the ForagerGO waterproof metal detector is an excellent option for all levels of skill and interest. It not only has a price that will appeal to the budget conscious but its light weight makes it a great choice for any size person. Young or old, big or small, the NHI ForagerGo waterproof metal detector is a great universal tool for any treasure hunter. • The inexpensive price tag makes it within reach of anyone’s budget. • Auto-tune prevents excessive adjustments and configurations. • A 72-page beginners guide. • Folding digging tool included. • Great for all ages and skill levels. • The waterproof feature does not equal underwater use. Use only on land. • The beginner’s guide is just that, for beginners. If you’ve been treasure hunting for more than a month or two, you probably won’t learn anything new. Until recently, it could be very difficult to find a high-quality metal detector that was lightweight and easy to manoeuvre and didn’t cost the earth. We like the ForagerGo Waterproof Metal Detector because of its high-quality features, the versatility it offers, and of course, its value. By far it’s one of the easiest to use detectors on the market, making it a snap for any treasure hunter to get started. 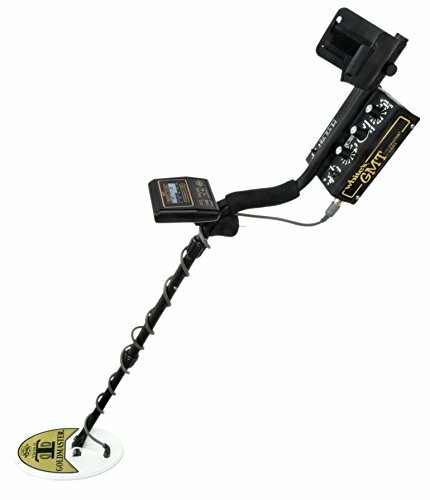 Its affordability makes it a clear choice for a fantastic metal detector under $200, or even over $200! The product comes complete with everything you could need, and its fine-tuning capabilities will allow you to tune out false signals even if you are working over an area of land that’s dense with natural minerals and other types of untouchable metal. You will be able to configure your ForagerGo waterproof metal detector to direct you to items that other detectors have people wandering around in circles. For more information or to buy the ForagerGo please go here. Just as a warning, you may, however, notice that your metal detector has a slight increase in false readings, which perhaps has something to do with the interaction with the frosty ground. And generally, some people report serious cold messing with their machine’s control box. Well… not literally, but it’s key to choose a hotspot area during the winter, i.e. one where lots of people coalesce together such as winter parks, outdoor hockey and ice skating rinks, ice fishing ponds, and snow sledging points. This follows the general philosophy regarding hunting (for non-relic items). While summer is more inviting for holidayers, winter is ironically often a time for outdoor play and leisure. So even if the ground is frozen you can often catch an array of valuables that have slipped out of pockets in these ‘hotspots’, including coins and pieces of jewellery – the whole season can provide happy surprises at the easily dig-able soft snow level. If you happen to be at or near a ski resort you wouldn’t believe the stories of people dropping items while getting off the lifts. This can also especially be the case in the spots where people commonly take breaks for rest and recovery. The removal of gloves during this period often arises in dislodged rings that become covered in snow, to otherwise be lost forever. Another interesting hotspot location may be gravel parking areas, for example next to sports fields or gyms. Gravel, during winter conditions, often doesn’t need to be dug into deeply in order to discover fallen items caught within it. The cool thing about detecting off-season is that there are less passerby’s interrupting your hunting – so you can get a lot more actual hunting work done and become fully absorbed in the process. Saltwater sandy beaches are especially suitable for metal detection during the winter if the metal detector used is suitable for water conditions. The movement of water tides helps to disperse the formation of snow and ice, and as a result, sand doesn’t tend to freeze beyond the ‘high tide’ area (although the dry sand further back will absolutely freeze in the colder periods). Regardless, if the ground is still tough, choosing a moderately sunny day will often do the trick and make the sand dig-able. Venturing into shorelines after rough weather is a good idea – often winds and bigger crashing waves will have churned sand up, revealing items that were before hidden deeper down. Many metal detectors have waterproof search coils (as a side note, I wouldn’t recommend carrying non-fully waterproof metal detectors across a body of water as it takes very little for a slip of the hand or feet to happen). This is only for the daring. If there’s a non-frozen area of water you can throw on a wetsuit or waders that have insulation and explore across shallow strips of water. Again, you will absolutely want to have a fully waterproof metal detector for this one as it’s easy to drop your detector in a moment of inattention, which will completely ruin its control box. Overall, choosing streams or other water bodies to hunt in is a fun way of making discoveries even in the winter – hunting through water can also be easier in some ways than ground. You’re less likely to have to contend with trash, for example, and digging is usually at a minimum. As always you want to keep your eye on research – this is the key to successful metal detecting, whatever the season. The most successful hunters do the best research – whether this is looking for areas with historical significance or choosing areas where large numbers of people gather during that particular part of the year. Research should also involve dynamic strategy; going out after a gale or big storm that involved big swells of waves can generate unusually frequent discoveries, and thick woods on high altitudes may have softer grounds. The key, of course, is to be persistent – keep trying and you will eventually find something! Like Indiana Jones trying to discover The Lost Ark, the metal detector game can get pretty complex. Finding the right one for you depends on precisely what and where you are looking to hunt. It sometimes requires Indiana’s degree of patience, problem-solving aptitude and willingness to explore the environment. If you aren’t looking for gold an entry-level detector will get you in the game. You want to make sure that the detector you choose is comfortable to use, as you may be swiping across environments for hours at a time. Repetitive motions can cause injury over time, so generally lightweight is good for a beginner who is still learning the ropes. Another caveat you need to consider is whether you intend to hunt in areas with high mineralization (also known as “hot ground”). These terms mean that there are high percentage levels of iron in the soil (this is the case in specific regions such as in the Pacific North West and Virginia). Highly mineralized ground may cause a false signal – essentially having a masking effect against the detection of valuable metal objects that are hidden just inches within the ground. Generally, entry-level detectors don’t do well with these environments. professional instruments and cannot be used for serious metal hunting (they will have very unreliable weak signaling and you will end up simply wasting your time). What you’ll need is an entry-level professional detector designed for beginners, but packing the punch to sniff out metal accurately and get you reliable results. In this article I’ll go through a selection of the best, most popular general- purpose beginner metal detectors so that you can begin your journey. This may be the best metal detector for beginners. The F22 is Fisher’s replacement of their previous model the F2, which was very popular for beginners. One of the coolest features of this detector is that it’s rainproof (although the control box cannot be submerged in water) – so the Fisher-22 is your best friend in dry or wet conditions. Another cool feature is something called iron-audio (which happens to be an uncommon feature for entry-level metal detectors) – this is simply a secondary tone that sounds, separate to the regular metal detection tone. That lets you know on the fly if your target has iron composition, saving you precious time from constantly checking your LCD screen. The control box gives you 4 detection modes (discrimination modes): jewelry, coins, artifacts and custom mode, with 4 separate tones to indicate target identification. Very importantly (to your shoulders) this is an especially light detector at only 2.3 ibs. The large 9-inch concentric coil lets you target large areas with each swipe. There are also 10 levels of sensitivity. Comes with a noticeably long 5-year warranty. The successor in the ACE line – the 300 is an upgrade to the ACE 250 with: extensions to its targeting ID database (now includes US coin denominations), a larger coil (10” – giving you superior coverage per swipe), better maneuverability, and improved audio functions. A cool added feature is that the frequency being searched for can be adjusted – you can eliminate particularly big interferences (such as from other detectors during group hunts). An overall higher frequency of 8 kHz means improved sensitivity to metal targets. Features 5 search modes plus the pinpoint feature, which lets you narrow down on the exact area where your target is by only registering a sound when the base spot, a small specific part of the coil’ directly below the handle in some cases, is directly over the target (saving you from doing more damage/sifting/digging than necessary). Also has 8 sensitivity levels. Comes with a 2-year warranty. Minimalist US-made design – instead of a digital LCD screen on the control box there’s has one super-simple central knob. It’s got a lot of good ratings and this may partly be down to its intuitive ease of use. The only setting you need to think about is the discrimination level. For example, when hunting a site with lots of rubbish just twist a single knob once to increase discrimination. This detector excels at discovering coins and can do well with relics. In terms of weight it scores a 10/10 – it’s extremely lightweight. So if you want to go easy on your shoulders you’ve got your pick. It even comes with a lifetime warranty (including free repair free of charge if you have any issues with it 8-years after initial purchase). METAL DETECTING WITH TRUST: Our electric pinpointer, metal detecting device helps hobbyists, collectors, bounty hunters locate the exact position of target identified by regular metal detectors with highly-responsive sensory components without discriminating any metals. Powered by one 9-Volt battery, MYM Pinpointer Metal Detector saves you both time and cost while fulfilling either your hobby or your duty. Please note that battery is NOT INCLUDED in the package. METAL DETECTING WITH GREAT PRICE: Our pinpointer helps you do the job at a reasonable price. Compared to big brands as Garrett Pinpointer, our device delivers you full package of functions at lowest cost possible. Simplifying your job today by using our pinpointer! 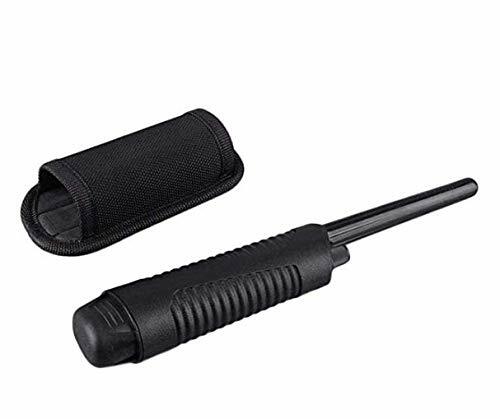 METAL DETECTING WITH VERSATILITY: MYM Pinpointer, handheld metal detector's sensitivity is completely ADJUSTABLE to increase the likeliness of locating exact positions of target. Our metal detecting device's sound system is also ADJUSTABLE, set the sound as your individual preference. METAL DETECTING WITH CONVENIENCE: Weighing at 5.1 ounces, MYM Pinpointer is super lightweight, convenient and mobile. Carry anywhere in your bag, backpack or tool box. This small, lightweight device employs precision tracking for speed recovery of location. It is ideal for recovery of small items in a wide variety of hunting conditions, ranging from highly mineralized ground to saltwater-saturated sand. METAL DETECTING WITH NO WORRY: We try to provide customers with best product at reasonable prices. Customer satisfaction is our utmost priority. If you are unhappy with our products, do contact us and we will give you an immediate replacement or a full refund. Try the product risk-free! 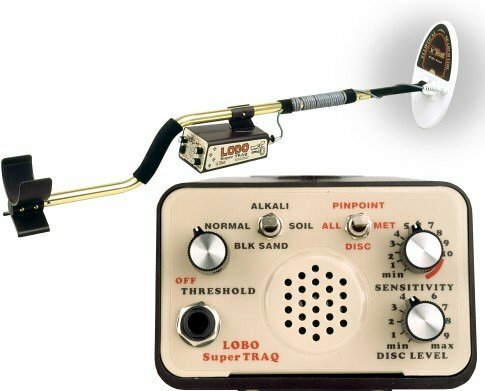 So that’s it – 3 super reliable and popular choices for entry-level metal detecting. If you want a weatherproof metal detector with lots of great features (including iron-audio), and great reviews, you really can’t go wrong with the Fisher-22. That would be my select pick for a beginner. But if you have other specific needs (such as even lighter weight, which the Compadre may win at) then perhaps one of the others may suit you better. Wishing you good returns on your hunting journey! This sifting pan mesh has terrific reviews – it’s patented with the SE (Sona Enterprises) logo, which lets you know it’s genuinely sourced. You can use it to filter out the large and worthless debris while sorting through your find, leaving the smaller pieces for classification. If you’re hunting for gold this pan will help you to filter material methodically – also filter based on the size of gold you’re expecting to come across in your location. 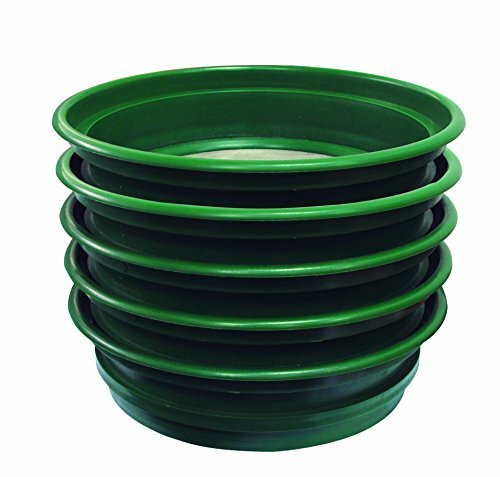 This should be a quite rugged sifting pan as it’s made of tough plastic – it’s lightweight and stackable. Choose a selection of individual meshes and stack them in a sequence (widest meshing in the top – they range in size from 1⁄2 inch to 1/100 inches). 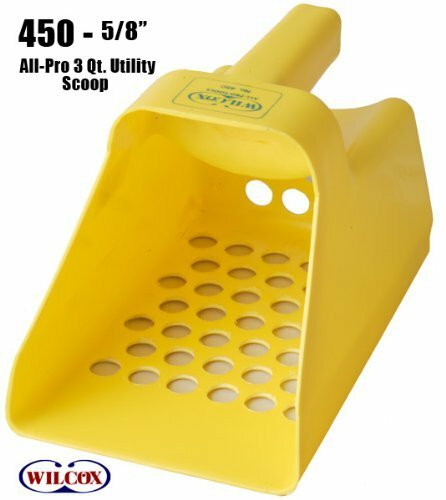 SE also sells a paired bucket, which you can pour the material you’ve harvested into over the meshes that fit over it in sequence like stackable bin lids. Next, twist the lids, loosening the collected materials – you’ll see them fall down onto lower levels. The mesh will automatically screen out the materials in size phases (classifications), which you can analyze one by one if you also have something like a grated bowl (reviewed next product down – #2) that you swirl water into (gold is heavier and so will fall to the bottom of the bowl). This really can be considered an essential accessory for professional gold hunters – allowing for routine speed and efficiency, and maximizing success during the many hours spent on the search. Top diameter of each pan: 13-1/4"
Mesh screen sizes: 1/2", 1/4", 1/8", 1/12", 1/20"
frustration. This pan however, has two types of riffles, or ridges, along its inside that allow you to trap gold. All you need to do is swirl water and tip out gradually, which will separate finer bits of collected earth and debris from any gold contained (as gold is denser than soil/typical debris). Gold that you trap will appear underneath the bottommost ridge of the pan. Overall – it’s an extremely rugged design. Expect this to last a long time, even with water use, as of course plastic does not rust or corrode. 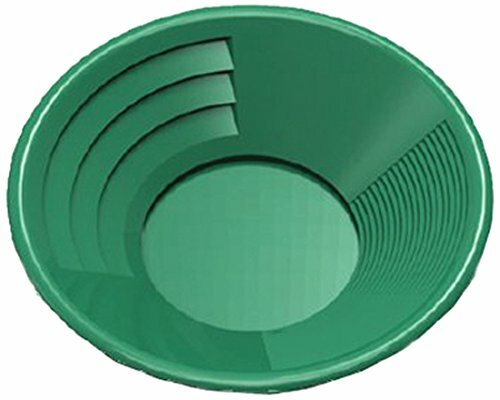 Another advantage of plastic is that it’s lightweight – SE also say the color will not fade, allowing you to easily see the color gold against the deep green pan (also comes in deep blue or black). Very simple product and works well with a gold pan or sluice. I happen to think it’s a cool name – “snuffer” – think of this product as like an anteater sucking up little flakes of gold. Using it will make extracting the very fine pieces of gold, caught by your bowl, just part of the routine. 4-ounce capacity. Headphones can do well in blocking out external sounds but can become sweaty and uncomfortable in hot conditions, particularly when you’ve been out for several hours on difficult terrain. 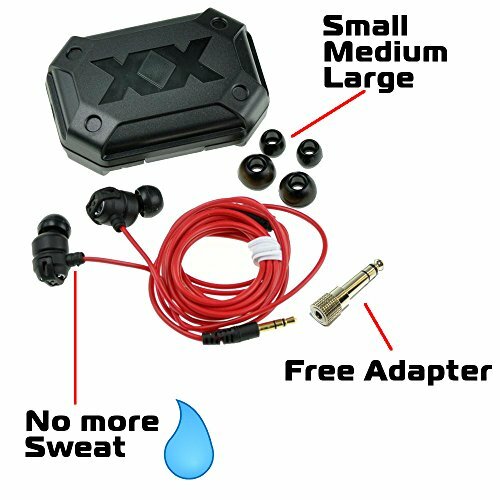 These in-ear earbuds bridge the gap between the freedom of earphones and the noise-cancelling ability of closed-cup headphones, so that only your own detector is what you hear. A cool additional benefit is that smaller earphones tend to produce less Electromagnetic Interference (EMI) that might otherwise have an affect your detector’s findings (as detectors use electromagnetic waves to detect metal). Comes with a 1⁄4 to 1/8 input adapter. 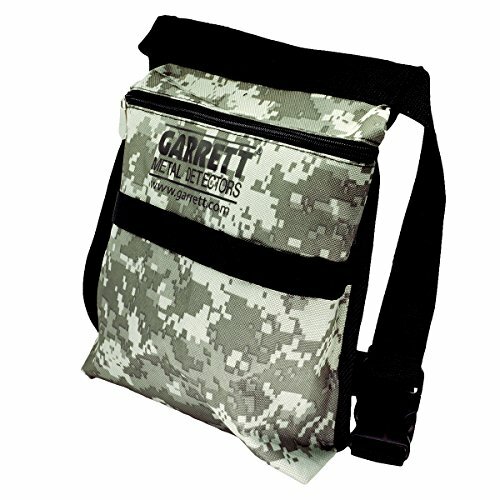 No more Heat, Sweat, and Discomfort on your long days in the field! Full in ear to block external noise including wind, traffic and other detectors. A collection of digging and investigation tools for groundwork and sand – comes with a metal spade, a plastic spade and a plastic scooper. Also included is a brass probe, giving you finer access without doing damage. There may be some issues with durability – the plastic tools are perhaps on the flimsy side, but it should be okay with soft sand. SE (Sonar Enterprises) or National Geographic scoopers seem to be better build quality. 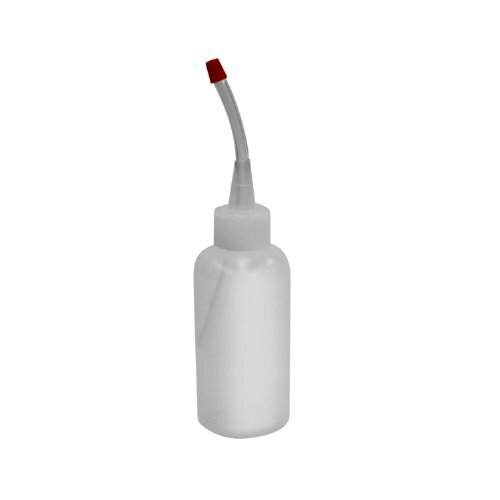 Nevertheless, this product has good reviews overall and offers a good range of instruments to investigate findings. For use with all hobby metal detectors! Top Seller. Coins & Rings will not slip through the holes! This pouch has a “camo” design and can be strapped around your waist (it’s adjustable, able to fit a child size, and can fit up to a 48” waist). Overall, a simple lightweight design and it’s got a bunch of pockets to let you separate objects, as well as an inner treasure pocket. It’s not waterproof but is water-resistant, so no need to be overly concerned with getting splashed or rained on with it on. Carry your water bottle, hand sanitizers, extra batteries, etc in this, as well as recoveries. Rather than storing dirtied metal in your pockets just stuff it in your pouch and move on. A 10” depth. 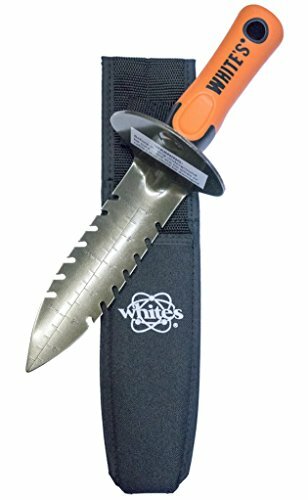 durable metal serrated edge that’s self-draining. A pretty indespensible tool for a metal hunter working with hard ground. There are the best metal detector accessories that we could find that came in under $50, most are under $20. Whilst you do not need any of these, they will make your experience far more enjoyable and rewarding (monetry wise). Whether young or old, metal detecting can connect you to your outside environment in an investigative, exploratory way – with the potential for financial reward. From trinkets like coins and jewelry, to relics and gold nuggets, there’s a horde of treasures waiting to be rediscovered. How Does The National Geographic Metal Detector Stack Up? Materials and build quality – will it last or fall apart with moderate use? The National Geographic PRO Series metal detector seems to hit the above criteria – in particular on measures of portability and ease-of-use. 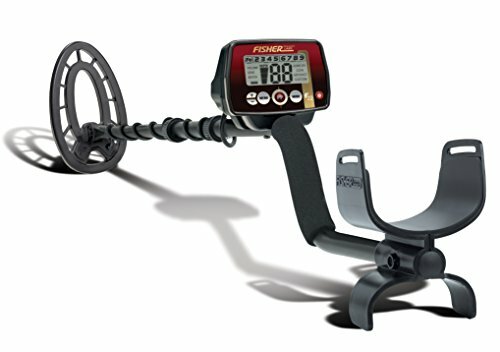 Its manufactured by a company called Minelab and is generally considered an excellent budget professional metal detector, with high-quality functionality and lots of good reviews at average 4.5 stars on Amazon.com. (You can grab it for around $160). 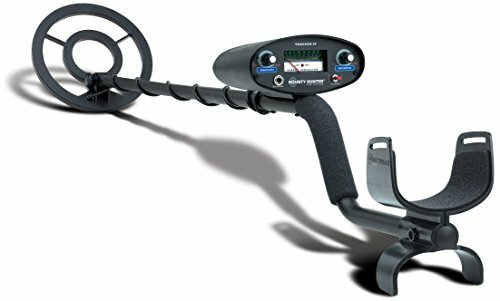 This Minelab metal detector was made for both first-time newbies – as well as pros who will appreciate its more advanced features. It comes with an illustrated learning guide pamphlet written by teachers, which takes you through: the history of metal detectors, how metal detectors work and the different types of detectors. It features a collapsible design that makes it highly portable – with a durable yet very lightweight build at only 2.3 lbs. The design’s surprisingly good for the price – wield it using a rugged arm strap and handle, for support and comfort. Also, the length of the detector fully extended is 51’ but this can be collapsed to less than half that size at 22’. What’s really cool is that the tone pitch will vary dependent on the general value of metal being detected – high pitch tones are best! One of the standout things about this detector, and something which Amazon customer reviews point to (no pun intended) is its very precise pinpoint feature. You can use the pinpoint location function to accurately hone in on the location of an object once you detect something, which saves you from dispersing more earth than need be. You’ll experience the pinpoint feature in real-time as a fun, squealing sound. You’ll lose this sound when the metal is not directly under the handle, towards the back of the coil, and it will reappear when you’re back on bulls-eye. Note: you can’t change the detection mode to ignore iron or aluminum when you’re using the precision mode. Read more reviews of the National Geographic detector here. This one’s for the kids and the professionals – with terrific adjustability and ease of use. You essentially just unlock and relock 2 latches: one to lift up the control panel and the other to expand the arm. Though it’s extremely light, the strap, which you wrap around your forearm, takes the pressure off your wrist. No assembly is required. The detector as a whole seems a little plastic in the feel of sliding the identifier open and closed, but that’s a minor point. Older kids may have no issues assembling and learning how to use this metal detector all by themselves. The battery house is under the top panel. Children can easily adjust the length. Because it’s so light kids will generally find it easy to use. If you’re in a noisy area plug your earphones into the earphones jack at the side of the panel. If you find you keep getting false positives or interference turn down the sensitivity. Such built-in advanced technologies and powerful capabilities make this portable metal detector any professional’s companion.